4 May 2018 Unlocked content from the archive. Hayley is a beekeeper, content with her place in her small, rigid, underwater world ruled over by a shadowy council. But while her friend Celia dreams of marrying a ‘netter boy’, Hayley stretches the rules, leaving the garden as she tries to hide migraines that could make her an outcast. It’s a small trespass, but a little knowledge can be a dangerous thing. Why does water drip from the ceiling in Engineering? Does God really walk the corridors at night? What is the council hiding from them? Each question takes Hayley further from the life she knows, while each answer makes returning an impossibility. But what else is there but the Hive? Hive sees Zac and Mia author A J Betts move away from the realistic YA she’s known for. Betts has created a unique closed world and an appealingly stubborn protagonist who, once she learns to ask questions, refuses to accept answers on faith alone. 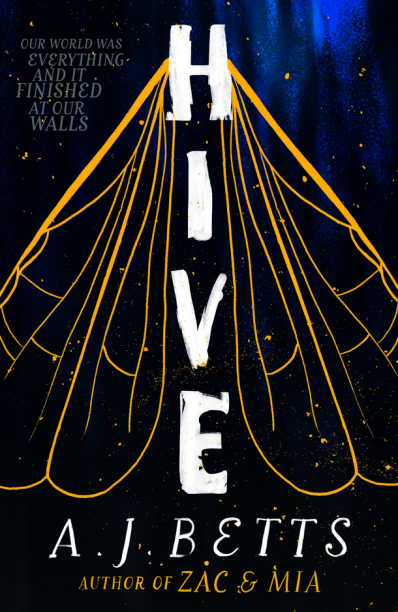 With enough dystopian details to appeal to genre readers, Hive nonetheless feels more intimate than other blockbuster dystopian YA titles. It will appeal to fans of Betts’ existing work and Ally Condie’s YA fantasy alike.